Life as Pink Einstein | Dallas Fashion and Lifestyle Blogger: Spring Break Recap! 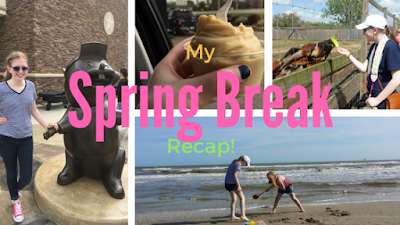 My spring break ended Tuesday so I thought I would share a little bit from each day of spring break with you! Also! There are two Boomerang videos in this post that do not work on phones, to view them you must be on a laptop. Day 1 (Saturday): I didn't do much on Saturday but my dad needed a magazine so me, my dad, and step mom (MB) went to the book store with him and while he was looking for his magazine we acted out poses from fashion magazines! It was a ton of fun and people were totally staring, it was greatness! The dude in the back staring is hilarious! Day 2 (Sunday): We celebrated my grandma's birthday which was last week and my dad's birthday which was later in the week. Every year MB and I make cakes and decorate them with fun icing and sprinkles! We ended the night with some Guitar Hero! This is the card I made my grandma for her birthday and everyone on Instagram said they want a blog post on how to make cute cards so I will have that up within the next few weeks! Here are the cakes we made! The one on the left is lemon frosting on a yellow cake and the other cake is cream cheese frosting on a chocolate cake. Day 3 (Monday): Monday I didn't do much, I kinda just worked on my blog and watched movies all day! Day 4 (Tuesday): My dad had to go somewhere so I stayed at my grandma's house for the day. Its great because my grandma lives right down the street so whenever my dad goes somewhere I go to her house and we always have a good time! I gave my bunnies to her last year so it's always fun to go see them too. Her dog is really furry so I pulled his hair up into a fountain ponytail! Here is my grandma's dog, Mr. Lionel, with his ponytail! Here are the bunnies! The gray one was my little sister's and the one in front is a baby! She is the most fun person to go shopping with! Day 6 (Thursday): I went shopping with my mom and packed for my trip. Day 7 (Friday): We left for Houston Friday morning and made tons of fun stops along the way! We stopped at a produce stand called Cooper Farms in Fair Field on the way to Houston and got some yummy peach ice cream made from their peaches! Of course we had to stop at Buc-ee's in Madisonville and to get snacks and t shirts. We stopped at the Sam Houston monument in Huntsville and took pictures. When we finally made it to Galveston we rode a ferry to Crystal Beach! It was a ton of fun! Our car was parked at the front of the ferry so we got out and watch the fish and the birds from the front of the boat. My little sister found a crab in a shell! Day 8 (Saturday): We realized Saturday morning we hadn't come up with anything to do that day so we spent the day at the park and when it got too hot for that we went swimming at the hotel. You can click here to read about my outfit! Day 9 (Sunday): We found out there was an alligator zoo/ petting zoo and we spent the day there! I took a ton of pictures but I am saving those for a separate post. After that we ate lunch at a restaurant by the beach that my mom took me to when I was a year old for lunch called The Red Snapper Inn. On our way back to the hotel we saw a Stephen F. Austin monument and stopped to take pictures. Day 10 (Monday): We went to the Houston live stock show to watch my sister and friends show their pigs. I didn't take any pictures but we had a lot of fun. My sister showed her pig really late in the day so we went shopping and hung out with friends. Day 11 (Tuesday): Since my sister showed her pig so late in the day we decided to stay in the hotel another night and go back the on Tuesday. We got home around lunch that day and I spent the day doing my homework. So that was my spring break! What did you do/ what are you going to do for spring break? Looks like you had a great spring break! That peach ice cream looks amazing!! Yes, my spring break was amazing! And the peach ice cream was delicious! That looks so fun! Your outfits are so cute. I hung out with friends and had some photoshoots! Thank you! It was tons of fun! And it sounds like you had a good spring break as well!